Bring back the black with BLACKFIRE! Is your vehicle plagued with dull, faded, and just plain unsightly plastic trim? While this isn’t a new problem, BLACKFIRE Tire & Trim Sealant is the new solution! The thick gel-like formulation penetrates deep into problem plastics and restores them back to their former glory. 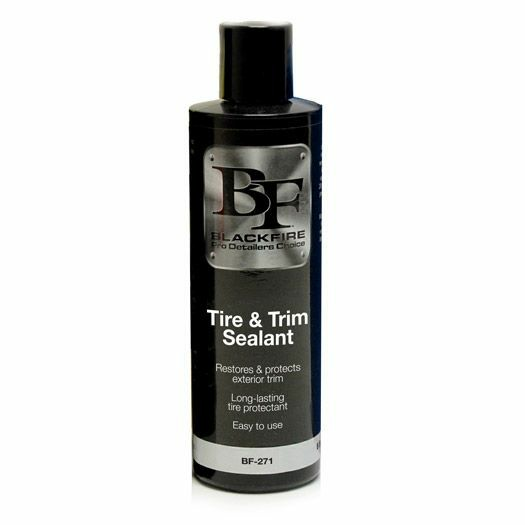 BLACKFIRE Tire & Trim Sealant isn’t just for plastics, it’s great solution for rubber and vinyl trim as well! Packed with BLACKFIRE’s proprietary polymer’s, BLACKFIRE Tire & Trim Sealant provides months of hydrophobic protection. It’s a common trait for most trim products to be greasy or leave an oil-like residue to provide a “improved” look. The problem with this lies in the fact that these trim products either fade quickly or vanish the next time it rains. BLACKFIRE avoided this by creating a thick gel-like formula that penetrates deep into the plastic and creates a chemical bond - providing months of protection and no sticky, greasy mess! Since BLACKFIRE Tire & Trim Sealant is a polymer-based formula, it is free of dyes or colorants. This means regardless of the color, BLACKFIRE Tire & Trim Sealant can restore the luster of your trim. Plus, you won’t have to worry about that new luster washing away either! The polymer-based formula provides incredible hydrophobic properties and will not streak or wash off like other trim protectants. 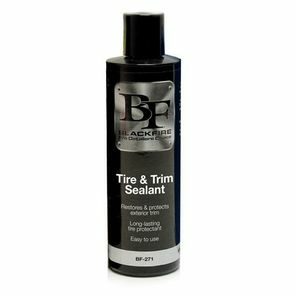 It’s time to treat your trim right, with BLACKFIRE Tire & Trim Sealant! Using a foam or microfiber applicator, apply a nickel-sized amount to applicator and spread a thin, even layer over the surface. Immediately buff surface dry with a microfiber towel. If applying to tires, use a foam applicator and allow to dry before driving.